Localizing & Internationalizing your in-app Support. Helpshift iOS SDK comes with support for 47 languages out of the box with English as the default. To enable the available languages, simply drag & drop the HsLocalization.bundle to your project. The Helpshift SDK will be localized based on the user’s device language. This can be set by going to General → Language & Region → iPhone Language. If the user’s device language is not available, English will be used as default. If the end-user has a language already set for their device (via Settings->General->International->Language) the correct language translations will be used. If the said language is not available English will be used as default. If you are adding strings for a certain language, it enables that language in your app when submitted to the App store. This has app wide implications and may cause unwanted problems if not taken care of. Specifically, this can lead the App Store to detect that you support a particular language even though you have not specifically added that language to your application. Make sure to only add those languages that your app supports. Select your Project from XCode, you can see the Localizations section as shown below, click on the + symbol to add your Localization. Select the localization you want to add for e.g., Dutch. 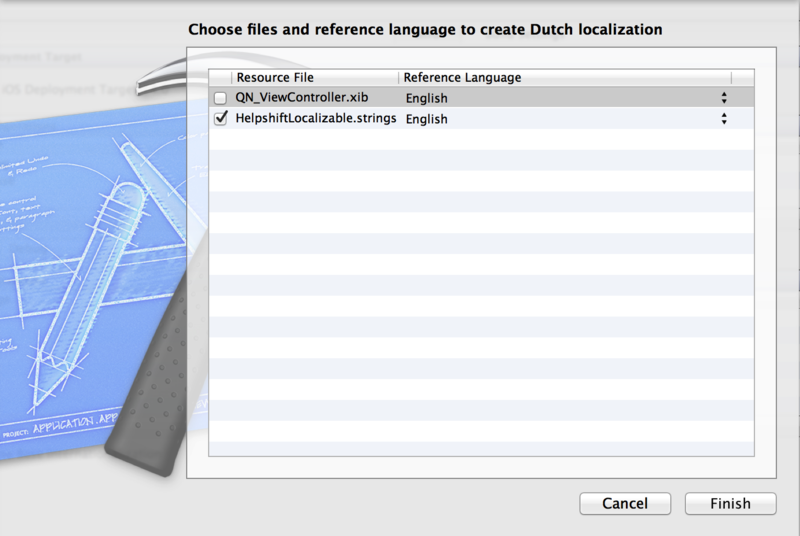 Once you have selected Dutch, XCode will prompt you to choose reference language to create Dutch localization, select HelpshiftLocalizable.strings and select English as reference language, uncheck all other resource files in your project to create Dutch localization for Helpshift iOS SDK. See below for reference. For versions 5.7.0 and above, the Helpshift localized strings come bundled HsLocalization bundle file. The HsLocalization bundle needs to be added to your project for translations to work for the Helpshift SDK. If you have already integrated an older version of the SDK, we would recommend removing the HSLocalization folder and adding the new bundle. The Helpshift localized strings (.lproj folders) have now been moved from HSResources to HSLocalization folder in the Helpshift zip file.The HSLocalization folder needs to be added to your project for the languages you want to support. Just remove the respective .lproj folders from HSLocalization for languages you do not wish to support. If you're using SDK v3.1.x or below, and you're upgrading to SDK v3.2.0, make sure to remove HSResources for v3.1.x from your project, add HSResources and HSLocalization separately (as mentioned above) from the SDK v3.2.0 folder. You can set the SDK language using the method setLanguage: . By default, the device's prefered language is used by the SDK. Now, head over to String Customization for the list of strings that you can customize as per your needs. It happens if sometimes you did not enable localized strings for the HelpshiftLocalizable.strings file. The Helpshift SDK reads all its strings from that strings file. 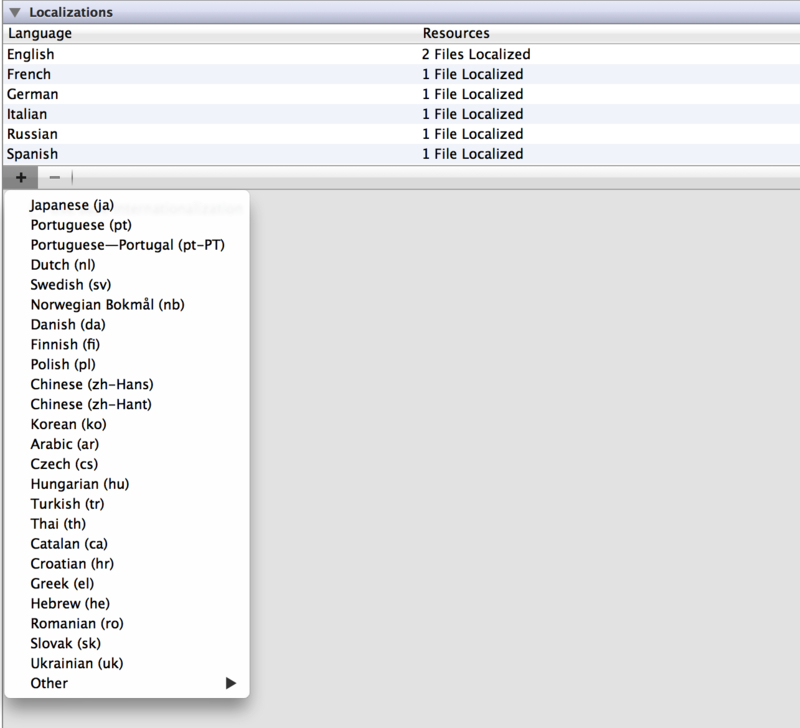 In Xcode on the left hand sidein "Project Navigator" select HelpshiftLocalizable.strings. On the right in "Show Utilities" select "Show the File Inspector". You will see a "Localize..." button. Click on that to enable localized strings for the .strings file.